The hookshot, a close relative to the grappling hook, is one of my favorite tools in video games. Being able to pull things towards you, or reach faraway points, is just an aspect that is so compelling to me. Now, the number of grappling hook games being so small in number should not be a surprise – Kepa of Rocketcat Games says level design for grappling hook mechanics is really difficult. And considering Super QuickHook ($2.99) is so brilliant, and few games have tried to copy it, that makes sense. But there’s such potential in a Zelda-style hookshot with a game being centered around it. 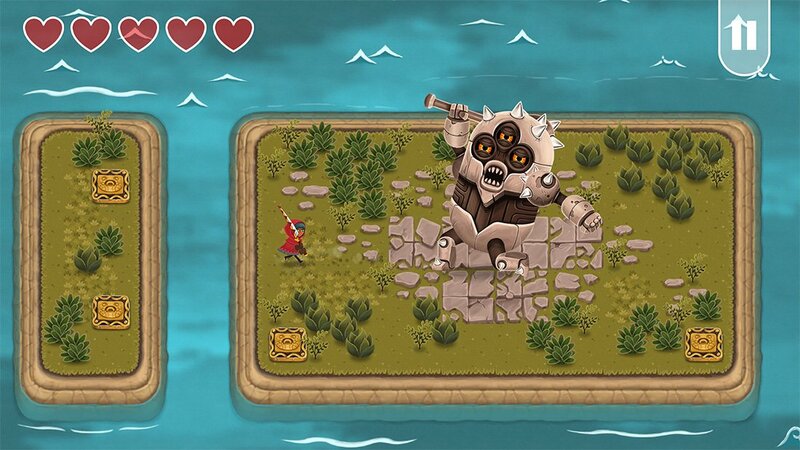 Legend of the Skyfish ($3.99) is that game, and it uses the core fun of grappling and pulling from a distance inherent in the tool to make for a solid action-puzzle game in the Zelda vein. Your weapon of choice is not necessarily a hookshot, but the world’s greatest fishing pole. Most of your enemies are aquatic denizens now walking the land in service of the evil eponymous Skyfish, and you’ve got to thwack them with your rod, and use the uncommonly strong line to pull in and stun them, for further thwacking. But your fishing pole has more utilitarian purposes beyond corporal punishment. It can also pull you toward grapple points, and remotely activate switches. There are a lot of puzzles where you have to switch between gate states to advance, or making it from point A to point B in a certain amount of time, and a little bit of box-pushing. But then the game throws some cool moments at you like having to trigger a slow-moving projectile and then switch gates as it travels so that you can hit a remote target that you need destroyed. And yes, everything in the game that can harm you can harm enemies, so if you drag a stunned enemy into the range of projectiles, they’ll take damage from them as you do. Legend of the Skyfish manages to transcend being a level-based Zelda-inspired game because it throws so many clever moments at you. Being able to take out an enemy by using the environment against them, such as the spike traps that trigger as you walk over them, is just fun. That you also have a tool that can manipulate the enemies to a certain degree – and that you get the “Get Over Here!" achievement for pulling a Scorpion on them – is part of the fun. The game centers itself around this unique hookshot-esque mechanic, and gives you encounters and puzzles that let you take advantage of it! This game is just fun because it feels like the developers sought out a fun gameplay mechanic, and then found ways to let you have as much fun with it as possible. Controls-wise, the game works pretty well no matter how you choose to play it. 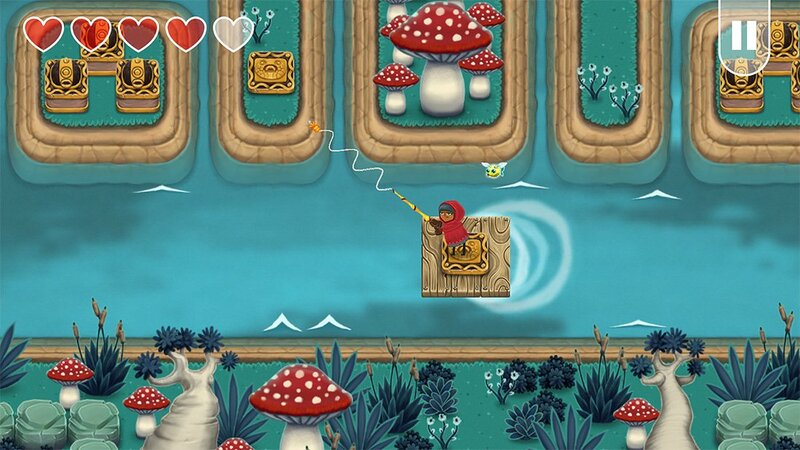 Touchscreen controls include dragging to movie, an attack button, and a joystick that you drag to aim your fishing rod. The game supports controllers, and it works well, though aiming is actually a bit easier on the touchscreen as there seems to be some jittery aiming on the MFi controllers I’ve used. That, or my caffeine consumption is starting to reach “Fry nearing 100 cups of coffee" levels. You can also play the game on Apple TV with the remote, and it works well enough with that, using the Play/Pause button to go into aiming mode. The issue is that there’s no cloud saving between the Apple TV and iOS versions of the game, so you’re locked into the platform of your choice. This seems like something developers need to implement early on, because why would I play the Apple TV version if I was going to be locked into it? The first world of Legend of the Skyfish is fine, showing some of the promise that the concept has. The second and third world are where the ideas really kick into gear. The game never gets overly difficult, but some of the puzzles and traps thrown at you feel rather clever, like the developers sought out to see just where they could take the design of the game, and stretched it to much of its logical ends. One moment where you have to quickly run back through a maze, triggering switches on the way back as you try to reach a limited-time gate that leads to a treasure chest is a particular highlight. The game won’t tax you too much, but it does show a spark of ingenuity in everything it does. The game isn’t super-long, with levels that individually don’t take up too much time. But add up all of them together, and you get a game that feels meaty enough without overstaying its welcome. The combat could be a bit more exciting – once you figure out that you can hook enemies to draw them in and stun them, it becomes the go-to move – and they’re really just there to provide slight obstructions. A follow-up to this game could focus a lot more on the action side of things, though the combat is far from bad or clunky here. The art is in a similar state where the game looks colorful and has some nice art, but the worlds only really vary by color, not by anything else. These repetitive parts of the game with combat and art are blemishes, but not particularly striking ones, and they hardly ruin the experience. 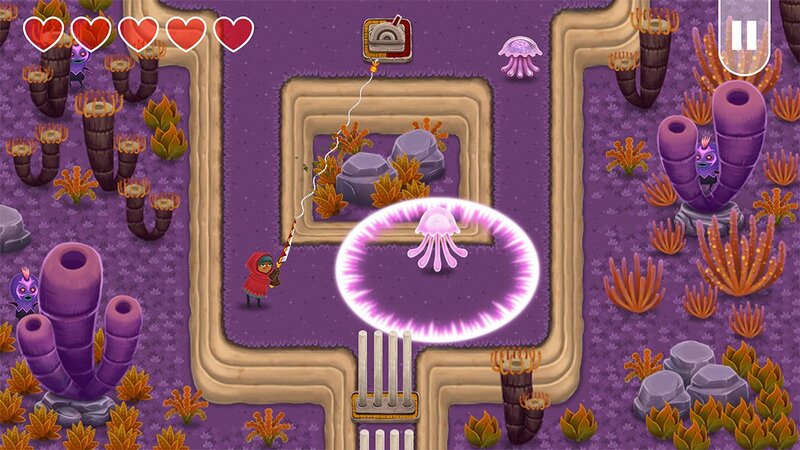 At its core, Legend of the Skyfish is just a game with a winning premise that its developers cultivated into reaching as much of its potential as possible. I could see where future content or sequels could expand the breadth of actions you can undertake with your magical fishing pole, sure. But this game right now is a joyous experience worth checking out.